So today is Election Day in the United States. Voting is most importantly a civic right and in many nations is required by law. It is baffling how many people complain about government and are cynical about its system; however, have never been to a community meeting or directly engaged a candidate. Let’s be real, if you are a minority, living with HIV, enrolled in public assistance programs, or not seeing issues in your community being addressed then you need to be involved. From actually running for office to just putting the candidates on the spot by asking a question like “what is your view on increasing Ryan White Funding?” we all have to understand that in order to see better results in our community we have to be engaged on multiple levels. Being engaged by vocalizing our issues, voting and most importantly making our elected officials and governments (local, state and federal) accountable for their actions is essential. 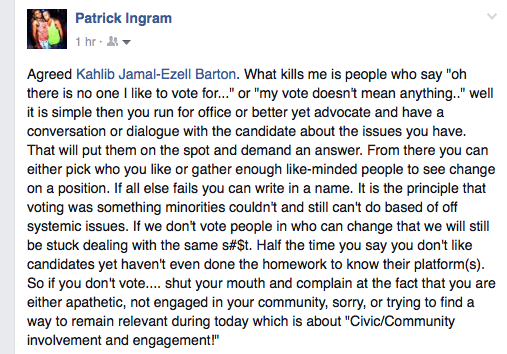 Too many times we vote people in public office based off of what we wish to see, yet never follow up until we are directly affected in a negative way. If I can wake up at 4am, walk my dog, drive two hours, vote, and be back at work then you can travel 10 minutes away and vote. It is simple yet not as tedious as you think. Check out my response over Facebook. Remember you can find me out Facebook, Instagram or Twitter!